Students of Pharmaceutical Medicine program took a trip to the Therapeutic Goods Administration office in Canberra on 13-14 September 2018, where they attended a series of talks and connected with their peers. UNSW Medicine alumna Elizabeth de Somer has been appointed CEO of Medicines Australia. Dr Chisholm has won the TOPRA Award for Excellence in Regulatory Affairs Education for 2017. Congratulations to Dr Orin Chisholm for her nomination for the award in Excellence in Regulatory Affairs Education from The Organisation for Professionals in Regulatory Affairs (TOPRA). TOPRA is based in the UK and is an international professional membership organisation for individuals who work in healthcare regulatory affairs. The organisation enables connections and promotes excellence across the healthcare regulatory affairs profession. The winners will be announced at this year’s ceremony which will be held at the Waldorf Hilton in London on 8 November 2017. Very satisfied participants after our 2-day Pharmaceutical Medicine training program for pharmacists from Shandong Province, China. Students enjoying a tour of the TGA laboratories. Please see the highlights reel from the day below. Best wishes to you all from the Pharmaceutical Medicine team for the holiday period and the new year! Members of the 2016 Pharmaceutical Medicine cohort recently took a trip to the Therapeutic Goods Administration offices in Canberra, where they met members of staff and connected with their peers. Dr Chisholm and Jan Cooper attended a very successful ARCS Conference at Randwick Racecourse on 5 - 7 May. 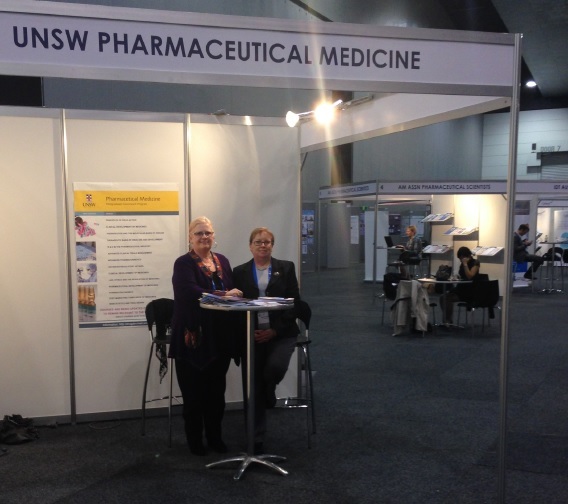 Dr Chisholm and Jan Cooper had a very successful time at the ARCS Conference in Sydney on 5 and 6 June. Dr Chisholm hosted a delegation from the Shaanxi Institute for Food and Drug Control, People’s Republic of China, discussing the regulation of medicines in Australia. Another very successful Weekend School was held at the UNSW campus on 13 and 14 April. Dr Chisholm outlined the Pharmaceutical Medicine and Drug Development programs in the recent edition of “The Source”, a publication by ARCS Australia Ltd, the professional development association for individuals involved in the development of therapeutic products.